Just before school got out in late-June, I discovered this little book in our storage room of class set books. Curious, I checked out a copy of Nujood to read over summer break. SUMMARY: At age eight, Nujood Ali was forced into marrying a man three times her age. She runs away and finds a courthouse, where she asks to see a judge and requests a divorce. Nujood is eventually granted the divorce, paving the way for landmark protections and rights for young girls in Yemen. REVIEW: I can't say that I really loved this book, but I do think it is an important read for today's teens. The world is not always a nice place, and modern teens (the ones you and I teach and know) truly need to understand that their lives are nothing like those of teens in other parts of the world. The more people know about girls like Nujood, the more help child brides can get. Nujood's parents, particularly her father, really made me angry. How is it that Nujood had so many important people helping her--people like her lawyer, the judge, Hilary Clinton, Katie Couric--and yet she still ended up living with her father again? Her father should have gotten some serious jail time, and I didn't really understand why he and Nujood's husband got off practically scott-free. So this brings me to what I didn't like so much. I appreciate that Nujood kept her positivity and spirit throughout her ordeal, but the "voice" of Nujood makes it sound like Nujood was really perfect and not too bitter or angry with her situation. I wish the book had spent some time exploring Nujood's emotions while she was married and the humongous obstacles she must have faced in escaping and asking for a divorce. It just didn't sound as difficult or perilous as it surely must have been. What's even more sad is what has happened to Nujood since her divorce. Her publisher arranged to pay Nujood's family $1000/month to help further Nujood's education. But according to a 2013 article in The Guardian, Nujood's father has kept this money for himself. 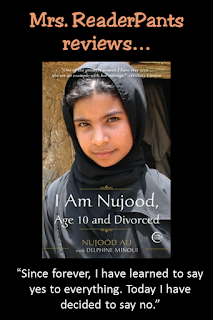 Nujood did not finish her education and is now married with young children of her own. THE BOTTOM LINE: This is a great discussion piece for a high school classroom. Despite its positivity toward Nujood's education and dream of becoming a lawyer, her real life hasn't turned out the way she had hoped. What an interesting discussion for a high school classroom. STATUS IN MY LIBRARY: We have it as class sets.